Published: Aug 19, 2015 to ? This Act II doesn't disappoint. In fact, it gets even better. The adding of these new first years is very well done and you just can't wait to see them grow along the main characters. Bonus point as they add some fresh humor. Otherwise, Sawamura and Furuya are still fighting for the mound, but Sawamura is not the unreliable pitcher he was in his first year and is acknowledged by all at this point. He still messes up sometimes but that's just his character. What remains for him is obviously to get the Ace title, and he gets closer to it day by day. He keeps advancing towards his goal to become Seido's best, but it's not easy with furuya on the team. At the same time, these two fighting for the same spot is the reason why they keep growing, and it is simply thrilling to watch it. This Act 2 also doesn't fail at reminding you that it's the last ride for some of our favourite characters... it's hard to read the last summer of the 3rd years. It just can't be helped, the team will clearly lose some of its appeal. The first years will have to fill that gap, but it seems like they will manage. The seido train hasn't lost steam at all, and it's a pleasure to be on board. I can't wait for the Season 3 though I know that maybe it will be published in 2018 or 2019. I'm in love with all the characters especially Eijun Sawamura who is persevering in achieving his dream to become the Ace eventhough there is Saturo Furuya who is a monster. I love their friendly rivalry with the addition of the great captain Kazuya Miyuki and the batting prodigy Haruichi Kominato. I'm also looking forward to the addition of the new characters, the great freshmen. They are great. They add new depth to the anime. Eventhough the third years will not be able to play baseball after three months, I know that the three sphomore main characters will be able to pull through with the help of their friends and kouhais. In the ACT II, Sawamura is and was able to portray his talent as a pitcher and he showed his vitality and action as an ace when they faced Ichidai in the semi-finals for Spring tournament. I was in tears because I felt his emotions and frustrations because Coach Kataoka didn't put him on the mound eventhough they were losing because of Furuya's failure. At that time, I hated Coach Kataoka but after giving it some thought I learned to like him again. I like all the characters of both the Anime and the Manga. They were and are able to catch the attention with their readers and viewers. I like the emotion flowing while watching the Anime and reading the Manga. Nobody had written a review yet so I decided to write one. This is also my first review ever so if something is lacking or totally biased please understand. 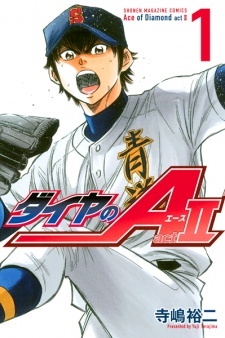 The story tells the continuation of Diamond no Ace. I recommend reading it first or finish both seasons of the anime. The story in Act II is not that different than in Act I, except for new grades and new characters. For me, the storytelling is stable and no sudden drop in hype. For the art, from the first time I read it until now, it's amazing. The readers can feel the intensity, the characters' feeling, and others just through the art alone. Of course the baseball action is brilliantly done. The characters are really well made and well developed, but some characters have only little development. The addition of new characters may overlap those characters' development, but it's still very fun to read. Considering that Sawammura is no longer just a junior, the manga is really focused on more Sawamura development than other characters like the first years. I personally enjoy every dialogue, every frame, every page, and everything of Diamond no Ace especially in Act II. The comedic scenes also haven't dropped a bit. Every new updated chapter feels very short and I can't wait for the next one to come out. Overall, it's a brilliant manga and is really greatly taken care of. All characters are lovable and fun to read. I really really really recommend this manga. i'm write this as some who know nothing about baseball when i started to watch ace of diamonds.since then i have learn a lot about baseball as well the character within the story. the beauty of this manga is that you get to see the main character's evolve form there first year and the thing he learn long the way. because this manga has 4 main character it does jump around a little bit that being said this a a sports manga so you know what your getting into. 1 the main character are fun to watch when interacting with other people. Another cour of Diamond no Ace comes to an end with a reminder: Yes, all those other teams are still out there, and yes, Seidou is going to have to play some of them sooner or later. This episode was as much about the Seidou of the past and future as the Seidou of the present－those who've left and come back, and those who will be a part of the team in the future.